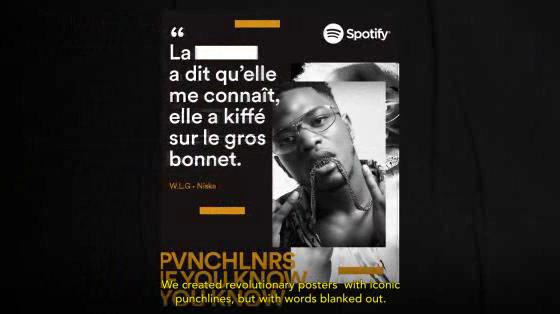 At the end of 2018, Spotify and agency YARD teamed up for an innovative and playful outdoor campaign designed to appeal to listeners of France’s hottest playlist PVNCHLNRS. Since streaming has taken over the music industry, rap has dominated the scene in France, and its influence on culture as a whole has been undeniable. The campaign from Spotify, created by YARD, celebrates the artists of PVNCHLNRS, the playlist which regroups all the genre’s heavyweights, and which counts more followers than any list proposed by Apple or Deezer. The concept: revolutionary posters with iconic punchlines, deliberately truncated. The idea? To communicate to the PVNCHLNRS community, to make them interact by testing their musical IQ with a lyrical guessing game. The campaign was displayed in city streets, metro stations. And even inside buses and metro cars, space typically occupied by cheaper or local brands. Spotify even paid homage to some of the rappers by teasing the campaign with painted versions of the ads in several of the rappers’ hometowns. A campaign as pertinent as it is entertaining, whose authenticity matches the quality of the playlist’s curation and the brand, and which is open to everyone. The campaign earned 3 million impressions and had a reach of 400,000 and helped the playlist earn even more listeners, over 50,000 in a few weeks.